My look was very simple and most importantly comfortable! 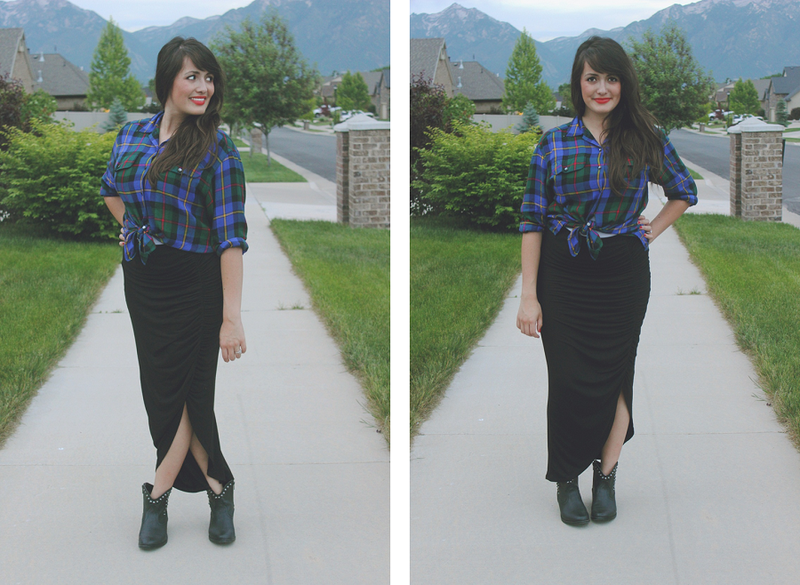 I wore an oversized plaid shirt, my new favorite maxi skirt, and some booties I got on clearance. I ended up thrifting this flannel shirt in the mens department a few years back. I didn't wear it very often before but little did I know how much I would wear it after I got pregnant. Since it's oversized it worked perfectly during pregnancy and since it's a button up it also works great for nursing! I like to knot it to give me a waist line instead of tucking it in for a more funky look. Target has been my favorite place to shop as of late. I've gotten so many staple pieces for my summer wardrobe. I rarely pay regular price for anything but I couldn't resist buying this maxi skirt. It's flattering on all body types and gives us women that nice hour glass shape since it's snug around the hips. I like that it has a slit that doesn't go too far up the leg and that it's super stretchy and easy to move around in. I also bought these booties at Target on clearance for a little under $11, not bad for a new pair of boots. 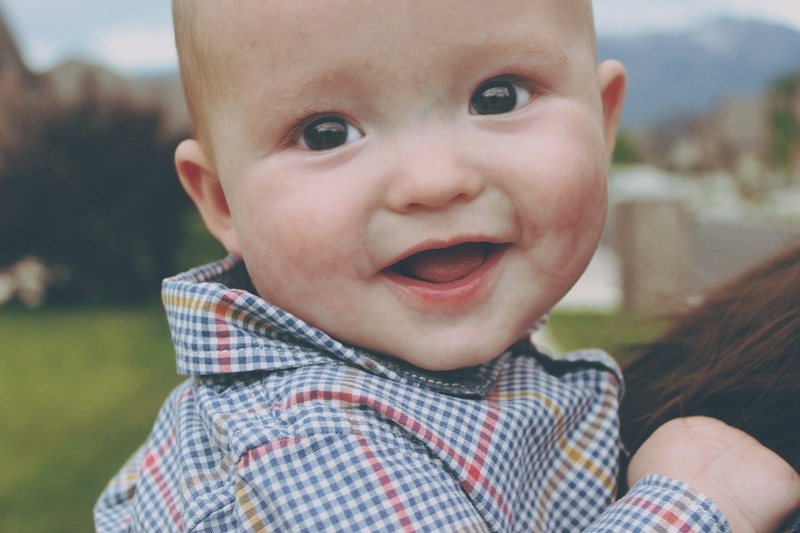 Oh my gosh, you are adorable and your baby? HE IS SO DANG CUTE! He reminds me SO much of my baby! don't worry! You aren't being too matchy. Just a little bit is good so you can compliment each other. I love all of the backdrops of your photos. Mountains are so pretty! I love your outfits. The red lips pop so well. 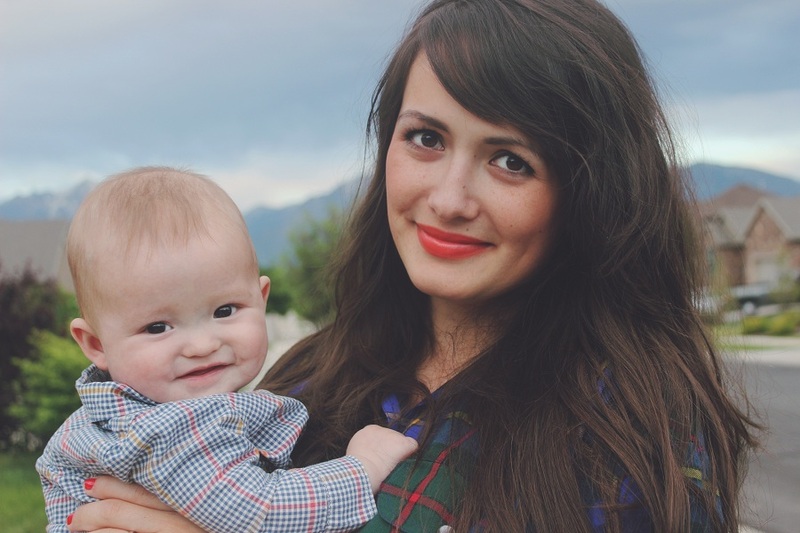 You and your baby boy are cute. love these photos, Cec Harvard! looks like z was being extra cute & you're lookin' hot. Eeeeek your babe is so cute! And I love this outfit. I have a plaid top really similar to this one! Love the dark green on you. Look at you two - so adorable! I really am loving that skirt - it does look super comfortable! 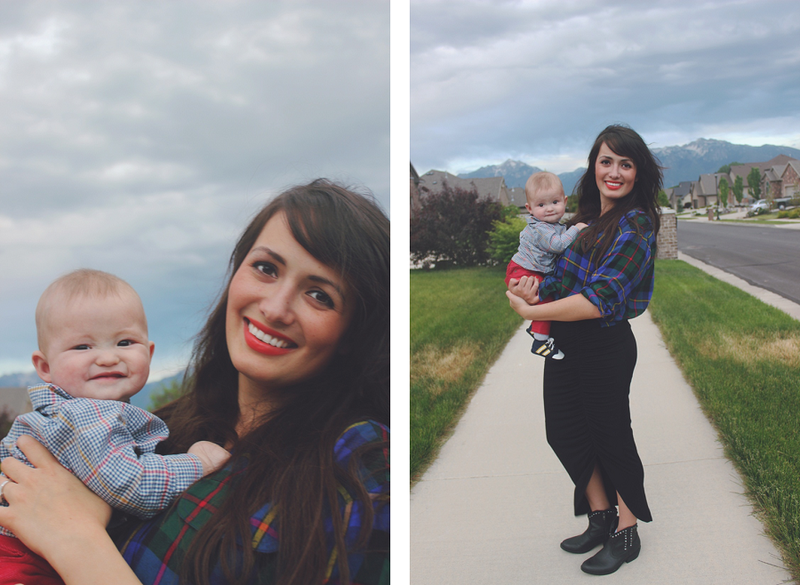 Your baby is so beautiful <3Both are so adorable and really love your skirt! You are really a fashionable mommy! I love that your red lips match his pants. You two are beautiful together! Z is getting cuter than ever! Lovely photos Cecilia! It's really your lipstick that caught my attention! What a well-dressed mom and son!